Netflix (Ticker: NFLX) has gone up almost 750% since the beginning of the year, (from $50.00 to $370.00 back down to $330.00) and it very recently went to an all time high before drastically falling. 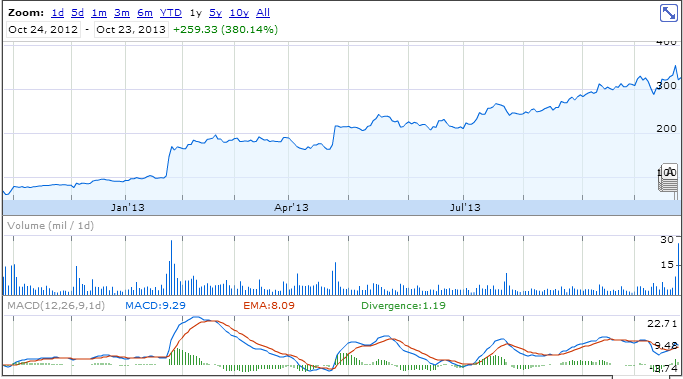 If you look at the one year chart of Netflix, you’ll notice how it’s just been drastically increasing since January. If you look at the dramatic increases of Netflix in recent months, you’ll notice that back in 2010, Netflix soared to these astronomical prices, before falling extremely fast to close to $40.00. So why do I think Netflix is a good buy? Well first of all, Netflix fell $40.00 dollars yesterday, because Carl Icahn dumped half of his nearly 6 million Netflix shares yesterday, causing Netflix shares to plummet. However, now that investors know the truth behind the drop, they started buying back into Netflix at the $320.00 range. Today alone it has made $8, and it’s poised to make much much more in the near future. As long as there is a market for investors to trade on, there will be people who respect quarterly earnings, and when Netflix reported a whopping 10% increase in revenue in Q3, the stock shot up 10%. A cheaper alternative to cable television, Netflix proves time and again that it will come out on top. – Every time Netflix releases quarterly earnings, it generally ends up gaining anywhere from $40 to $60 in after hours and pre-market trading. This carries over into the day after the market officially opens and Netflix generally grows from there. – There is a loss after a few weeks (2-3) after Netflix report previous quarter earnings. This time however, the drop came the very next day due to Icahn selling 3 million shares, but he said,”The stock remains strong and is severely undervalued.” In his 13D filing of the stock trade. Why won’t Netflix fall like how it did in 2010? It won’t fall 550% like how it did in 2010, it also wont just keep rising, but as long as there is internet, and Television holds the general public’s interests, Netflix will remain strong in sales and customers. But that isn’t answering the question. Basically Netflix has over 100 million PAYING customers. Each one of those customers is paying $8+ a month. And through advertising, Netflix broke 1 billion dollars in revenue last quarter. Even if Netflix does fall flat, it will be able to pull through for at least 6 more quarters before it runs out of cash for it’s needs. Beautifully done analysis and very well thought out. The charts were a GREAT idea and a good read all in all. Yeah thanks @Brent R. I did spend an upward of 2 hours working on the OP and post.